Have you ever been outside on a sunny day in late February or early March, and heard a sound coming from somewhere high up overhead, but you can’t locate what’s making the sound. Finally, after several minutes of gazing toward the heavens, you are able to zoom in on a wavy line or two in the sky. Most people think what they’re seeing is migrating geese, but the sound overhead and that wavy line in the sky is actually a group of Sandhill Cranes. I was in that number that mistakenly thought they were geese until my husband corrected my thinking. I didn’t know the first thing about Sandhill Cranes, so I did some investigating. Here is part of the information available on the internet. Sandhill Cranes are the oldest living birds on the planet. They can trace their ancestry back nine million years, judging by fossils found in Nebraska. The dry rattling call of the Sandhill Crane can be heard more than a mile away. The call is distinctive. Once heard, it is not forgotten. Many times the call is heard long before the birds come into view. Joan Stephens with the U.S. Fishing and Wildlife Services had information on the Paris Landing.com website that in part says: "One of the Tennessee National Wildlife Refuge’s most unique visitors has to be the Sandhill Crane. These birds are among the tallest birds in North America, standing up to 4 feet tall with a wingspread of 6-7 feet. Sandhill cranes are largely gray with a red patch on the crown of the head. Their long legs are black as are their beaks and feet. They are wading birds like the Great Blue Heron and spend their time searching for food in large freshwater marshes, prairie ponds, marshy tundra or grainfields. Their breeding grounds are up north ranging from Siberia and Alaska east across to Arctic Canada to Hudson Bay and south to western Ontario. The ones that migrate through here are heading to their wintering grounds in the southeast, which can be as far south as Florida. Hiwassee, a state wildlife refuge area in east Tennessee, has around 4,000 sandhill cranes that consistently use that area. 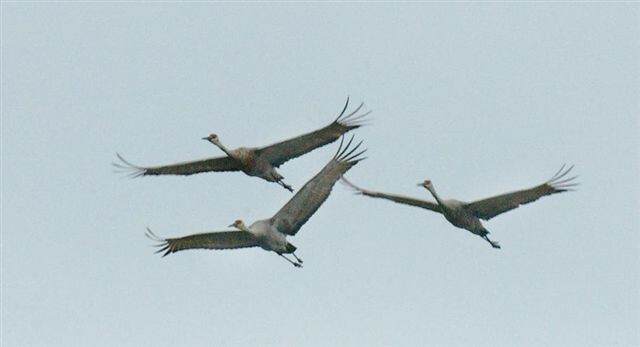 Sandhill cranes can migrate in great flocks and assemble in vast numbers at places like the Platte River in Nebraska. There birdwatchers gather to observe the mating dance that is quite spectacular. A pair faces each other, then leaps into the air with wings extended and feet thrown forward. Then they bow to each other and repeat the performance, uttering loud croaking calls. These courting birds also run about with their wings outstretched and toss tufts of grass in the air." Other information I came across said the when taking off, flocks of cranes ascend in great circling columns, riding thermal currents of rising air, then form into "V" formations. They fly very high and appear to be primarily daylight and fair weather migrants, traveling as far as 350 miles a day. A special characteristic of the Sandhill Crane is that the mate it chooses is for a lifetime. Now the next time you’re outside and hear that distinct sound overhead, just remember, that’s not geese you’re seeing. Those are members of the oldest living birds on our planet, Sandhill Cranes. The view must be spectacular from the height they are flying, and if it were possible to hear about their travels, where they’ve been, and where they’re going, I just bet we’d be amazed. If you missed seeing them this time of year, you might get another chance around November. They are on a return flight that time of year.